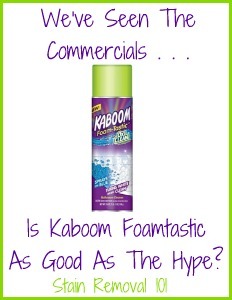 Below are lots of reviews of Kaboom Foamtastic bathroom cleaner. We've all seen the "amazing" commercials for this product, so I wondered how it really worked. I purchased Kaboom FoamTastic to clean my bathroom surfaces before my family came to stay for our Memorial Day celebrations. The shower doors had developed a filmy covering and this Kaboom foaming cleaner was able to cut through the grimy film and leave the glass doors shining and clean. I sprayed it on and it was blue, then I went to another room to tackle another task. When I came back it was white and ready to wipe off. It was the easiest removal, just wipe away and everything was gone. I was expecting to have to scrub and scrub, but I was pleasantly surprised! Other cleaners have worked, but they always leave a dull look to the glass, but this product left the glass door shining. After seeing how well it worked on the shower I used it to clean my tub to remove that ring of soap scum, and also to remove the hard water stains in the toilet. Same wonderful results! My favorite thing was the clean citrus scent. Such a refreshing change from the heavy cleaner scent of most bathroom cleaners. I will be using Kaboom FoamTastic to clean my bathroom from now on. Thanks for sharing your review of this product Viola. I'm always looking for even more product reviews from "Mom reviewers" and others who have used these products. You can share your bathroom cleaner review here, or read other reviews that have already been submitted. In addition, you can share your shower cleaners review here, and your toilet cleaner review here. Cath has also shared her review of this product. Kaboom Foam-Tastic with OxiClean is an overall okay product. I use it to clean my bathroom when it only needs touch ups. It gets sinks, toilets and the tub pretty clean. However, it does not clean like the commercial shows. You still need to scrub quite bit, and use other products with it. Especially with a toilet, most of the time as long as I have it on hand I will use the Clorox Toilet Bowl Cleaner instead. In my opinion this product is meant more for touching up bathrooms that aren’t too dirty. If you keep your bathroom pretty clean already and you just need a touch up this item is great for you. However if you have soap scum and a very dirty toilet this item will not be pleasing to you. Most of time this product turns blue too quickly; the product says when its clean it turns blue, however I don’t think that is the case. I think the product just turns blue once it has been exposed to oxygen long enough. Thanks Cath for sharing your review of this product. I will say, however, that something you said in your review makes me think you aren't leaving the product on long enough. The product, as designed, is supposed to turn blue basically on contact. Then, you are supposed to wait for a while until it has done its job and then it turns white when you are supposed to wipe it off. If you thought it was supposed to wipe off when blue I could see how your results would not be as good, because it would not have done its correct signal that the product was ready to be wiped away yet. I haven't personally used Kaboom Foamtastic myself though, so I cannot say how it works or not. I'm just sharing the reviews that have been submitted to me. I would love to hear from even more people sharing how this product has worked for you. You can share your bathroom cleaner review here, for this or any other product, telling me what you like, or don't, about it and why. You can also read other reviews that have already been submitted. I Personally Love This Stuff! I recently moved into a house that has the worst rust stains in the shower, toilet, and sinks. To top it off the tub drips so there was a massive amount of rust around the drain. I tried all kinds of rust remover cleaners, CLR, Limeaway, etc. and this is the only one that actually put a dent in it. t does smell horrible though. Thanks for sharing your experience with me Beth. It can be difficult to find something that will work for removing rust stains, so I'm glad to hear this worked for you. I'd love to hear from even more people sharing their tips for removing rust stains from objects, with either home remedies or commercial products. You can share your tips for removing these stains here, or read others already submitted. Further, you can read rust stain removers reviews here, or share your own. Steph has shared her review of Kaboom Foamtastic, and also referenced the review above from Cath. I have to agree with Cath. I bought Kaboom Foam Tastic to try, since my bathtub get soap scum very easily. My bathroom is not a very dirty bathroom. So I used Foam Tastic and I agree, it turns white almost instantly (I think that's what Cath meant). And to get the results you want you have to scrub like the other products. Don't get me wrong, it works, just not as good as it claims (like in the commercials). Overall, I wasn't satisfied and I think I'll stay with Clorox (even if I have to scrub). I get better results. Thanks Steph for sharing your opinion and experiences with this product. Like I said previously, I have not personally tried this product, but am instead sharing reviews from others. I would be curious to hear from even more people to know if they also have experienced the product turning white almost immediately. Don't waste your money. What a big disappointment! Turns white fast enough, wipes off easily enough, but... doesn't clean the soap scum or hard water spots. I had to use 2 other products and scrub a lot. You can also tell me what your favorite bathroom cleaner is, and why, be it this or another product. Erin shared her opinions and experiences with this bathroom cleaning product. Like others have said, this stuff turns white instantly. It has no way of "knowing" if the surface is clean; it just automatically changes color right away. I left it on for a little while anyway, and still had to scrub. It did a lousy job on grout and a mediocre job on tile. It didn't even touch the hard water stain in the sink. And the smell is TERRIBLE. It's an incredibly strong smelling product. I won't be buying it again. Since I need to wear a mask either way, I may as well use bleach and a scrub brush and actually get a clean shower. The only thing this product does is loosen up grime so you can scrub. I almost never complain to a company and I e-mailed Kaboom to tell them that this product was being advertised falsely. Don't waste your money. Thanks for sharing your Kaboom Foamtastic review Erin. Sorry this product disappointed you. You're definitely not the first person to mention this cleaning product does smell pretty strong. Hopefully you'll find something that works better for you in the future! Another SR101 reader also has been disappointed by this product. This stuff does not work in the least. I went over the area 3 times and it made no change. This is a gimmick. I should have known better. I tried it on different surfaces and still no results! $4 bucks down the drain, literally!! This product is grossly over rated and awful. I did not see any difference in this or most other cleaners. Lime Away is good, Scrubbing Bubbles is good. Kaboom didn't really do anything great and the color was disgusting. I will never purchase it again. The shower didn't look any cleaner then before I started using it. Kaboom Foamtastic does not clean as advertised. Yes, I did read the review from someone who applied this to her shower doors and it worked, however, I do not have shower doors, I have a cast iron tub and sink and this product did not clean at all! I had to go clean over it with Soft Scrub! Not only does it not clean as advertized, it smells terrible!!! Ladies who like their house smelling good and fresh, do not use this product!!! Please do not ever use the product in the aerosol can. I ended up in the emergency room after spraying only a very very small amount in my shower. The smell made me choke and after wheezing for hours terrified I ended up in the ER and then admitted and on IV steroids for 9 days. Since that date (June 2011) I have been on oxygen 2 percent 24/7. Today's date is 2/14/2013. My life has been changed (ruined) forever. Please stay clear of this product and tell all of your friends and family to steer clear of the aerosol can at the very least. I just received this as a comment, so I cannot say with certainty if this is true or not, but it is scary and something to at least consider before using any aerosol cleaning product, which I imagine is much easier to inhale into your lungs. My bathroom is very difficult to keep clean. The apartment building has shared bathroom facilities, and in order to live in a clean environment I have turned to scrubbing it myself. 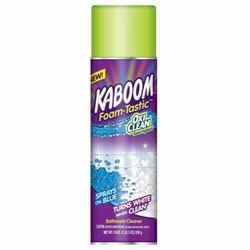 The texture of the shower walls and door made it extremely difficult to clean until I picked up Kaboom. The blue foam effect was definitely amusing, but the smell was pretty awful. However, the foam did its job – I was surprised to see how much filth just washed away with a quick rinse. The less effort I have to put in, the better! I would advise staying out of the room for a bit after spraying everything with the foam though. Let it work for a while, then return and rinse the surfaces. This should help you avoid a headache from the unusual odor. Other than that, this product was a wonderful solution to my particularly grime-covered problem. I now keep more than one can under the sink. Thanks Nick for sharing how this product has worked for you. Unfortunately, this is nothing new when it comes to cleaning products, and is one of the reasons, I think, that people are turning to more Earth friendly cleaners. However, I do think it is interesting from the perspective that Kaboom advertises itself as having "no obnoxious fumes." I would be interested in hearing other people's opinions and experiences with this product, and especially about what you think of the scent. You can share your review here, for this or another bathroom cleaning product, or read other reviews already submitted. In addition, you can share your shower cleaners review here, and your toilet cleaner review here, or read other reviews of these products already submitted too. Kaboom Foamtastic stained my white painted wood bathroom door - help! I used the Kaboom Foam-Tastic cleaner in my bathroom. There was blue residue from the nozzle that got on my hands unknowingly. I was leaning down to wipe down my tile floor, grabbed hold of my white wood painted door and 2 days later discovered a blue stain on my door! Both sides where I had grabbed the door! I have tried vinegar, lemon juice, toothpaste, magic erasers, and LA's Totally Awesome with absolutely NO success! HELP!!!! I have even called Kaboom's 1-800 number and the rep apologized and told me to use vinegar. It did NOT work. Any suggestions???? Kaboom, that is what it does for your lungs! 2) I first wash my shower with Kaboom and then rinsed it off, I thought...but after I sprayed some bleach on the wall, I saw the blue showing again. I know bleach is bad to combine, but I thought I had wash and scrubbed the stuff off, no, it appeared again. So, I am taking it back to the store, never, seeing it in my home again. I hate scrubbing. Yes it has a strong smell but that is probably all the chemicals getting the one month worth of grime off because this chick be too lazy to clean it. For people like me who need a quick simple way to clean everything. I like the way it has made my life just a little easier. Also after it is washed off the way it leaves my bathroom smelling is amazing and it smells so clean. Now if only it would clean my floors, do my laundry, wash my dishes and take out the trash for me. I've got two babies and not enough time to clean. I purchased the Kaboom Foam-tastic and was using it daily for about 2 weeks, did a good job but all of a sudden the sprayer apparatus wouldn't work. I removed the top piece and cleaned it in hot water, still wouldn't spray, took a long thin wire and inserted down the tubing in case there was a blockage, still didn't work. After trying this several times I got very frustrated with this product. Can't take it back to the store cause I live in Canada and purchased 4 cans when visiting the US. If this product ever made it to stores in Canada I sure won't be recommending this product. When I first sprayed Kaboom on my tub when I rinsed it worked with cold water. But I come to see that using warm water works better. I seriously love this product. Now when am I hoping it comes out with laundry detergent or laundry powder. I used Kaboom on my brand new grout and it is stained blue all over. I have used bleach, and any other product I can think of to remove it and it will not budge. I will be calling the company direct to remedy this problem. I used the product as directed on a barely used/dirty tub and i was left with awful stains. I scrubbed, rinsed, waited and have a nasty looking tub. Please help. This stuff not only has an obnoxiously strong smell, the odor lasts forever. I have sprayed it and left the room with the fan on for up to an hour hoping I would be able to tolerate the residual smell when I returned, but it didn't help. It gets into my lungs and gives me a terribly sore throat. It feels like a chemical burn. In addition, it doesn't do its job. It takes off minor soap scum, as others have said, but not without scrubbing a little. Anything more than minor soap scum requires another product and serious scrubbing. Sprayed this product on a small area of tile in shower. Waited till it turned white, was excited to see it looking clean, but it completely burnt through several spots of the grout! Never have I had a product to do that. The fumes are strong and last a long time. This product might seem like a miracle worker to some, but not to me! Taking back to the store.